Now that everyone is living longer and looking to stay as young as possible in their later years, modern men are beginning to take notice of their skin. Yep guys, I’m talking skincare, shudder. The truth is, we probably already use (or need) many types already- shaving cream, aftershave lotion, sunscreen, hair products and soap. The problem is most of these products are made with harsh chemicals, and many can be a bit on the flowery side of fragrance. 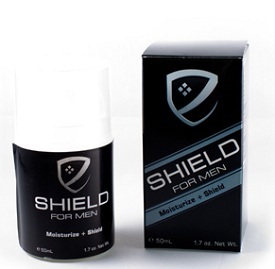 Worry no more, Shield For Men has a guys solution to all of these problems. Shield For Men, provides fresh, hand made to order, all natural/organic skincare products to men with a masculine twist. I was lucky enough to receive a sample to try, and I was quite impressed. Not only did the cleanser and moisturizers work brilliantly, they also had a distinctly masculine scent to them. I used the Moisturize+Shield as an aftershave and face sunscreen and Wash+Protect as a straight up replacement for my shower soap (bodywash if you like). Both products exceeded my expectations and I felt good about using them. Infused with essential oils and natural extracts (as opposed to chemical and synthesized fragrances) such as cedarwood, rosewood and patchouli. I know you see that last ingredient and are thinking hippie, but all of the oils combine into a woody, fresh and natural smell which is quite subtle. Bottom line, Shield For Men is a great natural alternative to the chemical-laden skincare products out there.